Among the many novelties from Patek Philippe this year, the World Time Chronograph Ref. 5930 is gaining favours with the press and collectors. For the first time, the Geneva-based watchbrand combines its patented World Time mechanism with a proprietary chronograph, resulting in an easy-to- read and easy-to-use timepiece that provides the local time in hours and minutes, a display of 24 time zones, day/night indications, a chronograph hand and a 30-minute chronograph counter at 6 o’clock. The self-winding mechanical movement Caliber CH 28-520 HU is enclosed in a round 39.5mm x 12.86 mm thick (crystal to display back) 18K white gold case surrounding a superb blue opaline hand-guilloched dial that displays 24 cities printed in white, a 24-hour ring with day/night indication in colour and sun/moon symbols, and applied baton hour markers and dauphine hours and minute hands in 18K white gold with luminescent coating. The Parfil central chronograph hand and 30 minute counter hand are in rhodiumed steel. A 2 position crown that sets the time and winds the watch, with chronograph pushers at 2 o’clock for start and stop, and 4 o’clock for reset and flyback, and a time zone adjustment at 10 o’clock, make this World Time Chronograph super user-friendly. With a 50 – 55 hours power reserve, water resistant to 30 meters, this timepiece is enhanced with a hand-stitched matte navy blue alligator bracelet with foldover clasp in 18K white gold. Patek Philippe Seal. 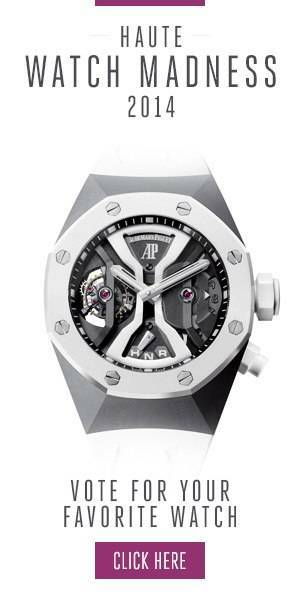 Available in September, priced at 65,000 Swiss Francs. Another show-stopper at the Patek booth is the Patek Philippe Grandmaster Chime Ref. 6300. Featuring the same 20 complications as the 175th anniversary masterpiece presented in 2014, including 5 strikework functions, this new hand-guilloched 47.4 mm white-gold case has a softer, more sober appearance than the totally hand engraved Ref. 5175 7-watch commemorative edition. You might have to wait a while to have yours, there will be only a few pieces made every year, with a price tag of 2.2 million Swiss Francs. For buyers interested in a 24-hour time zone watch without a chronograph function, the famous World Time watch is being relaunched with a new 38.5 mm rose gold or white gold case, a newly designed pierced hour hand, and a manually guilloched dial centre that is positively stunning. Completed with a shiny black or shiny chocolate brown alligator strap. Ref. 5230 World Time. Self-winding mechanical movement Caliber 240 HU. 42,000 Swiss francs in either gold. Ladies have not been forgotten. The new Calatrava Timeless White with a white or rose gold round 33 mm case is simply beautiful. Ref. 7122/200 with its manually-wound mechanical movement Caliber 215 PS features a seconds subdial at 6 o’clock and gold applied hour markers on an immaculate white lacquered dial surrounded by a diamond-set bezel. Complemented with a pearly white alligator strap. Water resistant to 30 meters. Available from July, 24,000 Swiss Francs. Other novelties include the new Annual Calendar Ref. 5396 in tribute of the 20th anniversary of Patek Philippe’s patented Annual Calendar with day, date and month apertures, moon phase, 24 hour display and sweep seconds hand, in white or rose gold 38.5 mm case. Self-winding mechanical movement Caliber 324 S QA LY 24H/303. Available from May, prices starting from 42,300 Swiss Francs. Surprisingly, while this is the 40th anniversary of the Nautilus, no celebration pieces are being officially presented. But hush, we are told to expect something during the course of the year, and you will be the first to know after we do. Follow Haute Time on Instagram / Facebook / Twitter to experience Baselworld 2016 in real-time and catch all of the new releases as they happen.